Additional authors: Joseph, Dan -- (Journalist), -- author. Published by : Indiana University Press (Bloomington, Indiana) Physical details: xiii, 323 pages : illustrations ; 23 cm ISBN:9780253037480 ; 9780253037497 . Includes bibliographical references (pages 285-313) and index. 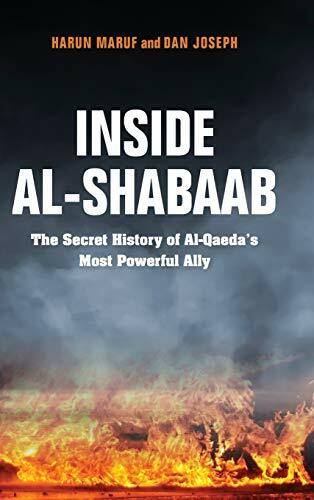 Foreword / by Christopher Anzalone -- Sources and acknowledgments -- Prologue: birth of a militant -- Origins and rise -- Jihad arrives in Somalia -- The CIS, warlords, and Ethiopia -- "The real jihad has just started" -- Godane -- Al-Shabaab Americans -- Radical organization -- The battle for Mogadishu -- "TFG in grave jeopardy" -- "Send troops... within 24 hours" -- Zenith and stalemate -- The Ramadan offensive -- Withdrawal -- On the run -- Divisions and purge -- The road to Westgate -- No place to hide -- Resurgence -- Arresting the decline -- The ISIS incursion -- Al-Shabaab's future.